In November, I had the privilege of announcing the return of The Federation’s Research to Practice Network. Now, six months later, we are excited to begin sharing the articles and summaries that have been contributed by our Associate Members, post-secondaries, and other research bodies. 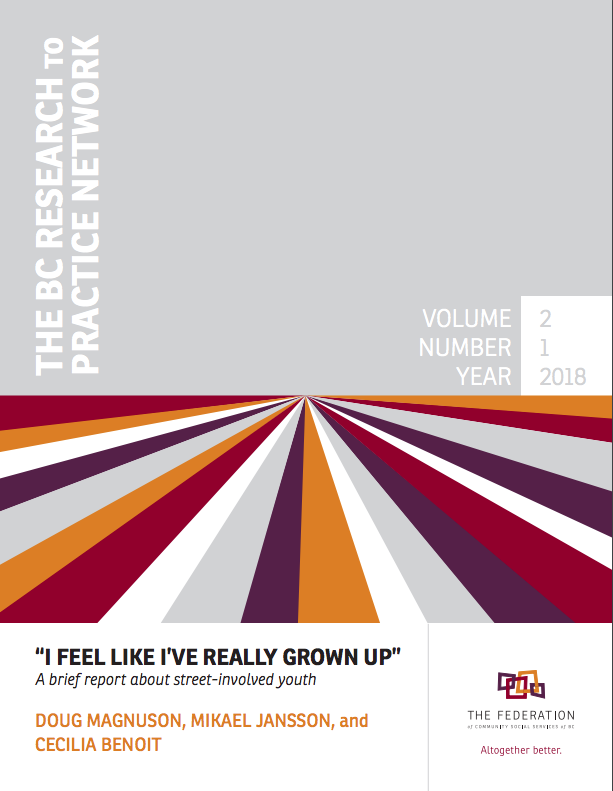 The first article, by a team from the University of Victoria, is a preview of a forthcoming book that shares the process and findings of a long-term study of street-involved youth in BC. The analysis draws from interviews with over 200 participants that were followed over a period of 6-10 years. The findings speak to the nature of the instability they experience and their struggles toward adult lives and adult identities. In their conclusion, the authors report on where the youth are now and how many remain street-involved before suggesting ways to help such youth re-integrate into social structures like school, work, and family. You can access and download the article here. (You can also review past articles that the Research to Practice Network published between 2008 and 2013). And the Research to Practice Network is also a way for us to engage our Associate Members and post-secondaries across the province and create opportunities for them to help inform service delivery—especially since each area of work is very much informed by the other. That’s the great advantage of being part of a Federation that also includes umbrella organizations, post-secondary schools, and other research and advocacy groups: the direct connection between the people focusing on advocacy, research, and evaluation and the people focusing on service delivery. As always, if you have feedback about this member service and/or how we can improve it, please let us know. There’s a lot of information out there related to service planning and delivery and The Federation is committed to sharing as much as we can in a way that is as helpful as possible. Is there an area of practice your staff members are keenly interested in? Is there a community issue or aspect of service delivery that your team wants to better understand? Help guide the direction of the Research to Practice network by identifying topics and issues that deserve to be focused on. Contact Marshall Watson at The Federation office with your ideas and input! We’re inviting professors, students, and researchers to submit short articles and research summaries that can help improve front-line service delivery in BC’s community social services. If you know of and/or are working in areas related to reconciliation and decolonizing practice, youth in care, early years, leadership, complexity, child and youth mental health, residential care, autism, housing, seniors, substance use, resiliency, or training and supervision of staff, please contact us! You can also help us get the word out by circulating this call among your students and faculty members. If you are interested or have any questions, contact Marshall Watson at The Federation office. Click on the cover image below to view and download the report!